The computer repair man telling Paul that he can't fix the computer as he's not sure what is wrong. Caroline looks guilty because she installed some software against Paul's wishes. 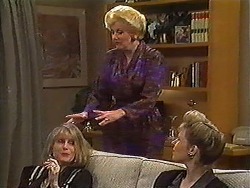 Madge is telling Beverly about inviting Felicity Brent over for dinner, she's worried about her being a “Dragon Lady”, and she invites Beverly for dinner who accepts. Madge has forgotten that Eddie starts work at the pub tonight, so she has to go over later to show him how everything works. 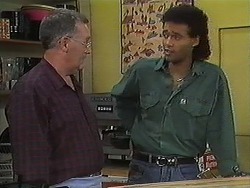 Eddie wants to leave early so he can move into his new place and Harold agrees after Madge tells him to. Paul has bought Caroline some flowers to apologise for shouting at her about the computer. Paul says he will sack anyone if they installed the virus, Caroline says she has a bad headache and needs to go home. Matt is round, he needs a lift to his driving test, he is here to ask Kerry but she is out but Joe says he will instead. Joe insists on borrowing Matt's Walkman to listen to some music. Madge has borrowed one of the Robinson's sofas as her is being recovered; Eddie has carried it in for her and goes to pack. Joe is dancing to the music on Matt's Walkman as the instructor approaches so Joe leaves. The instructor says he will be tough on Matt and asks for some encouragement to be nice to him, he asks for 50 dollars! Matt insists he won't pay but the instructor says he may never pass if he doesn't. Matt goes over to Joe to ask him for money, Joe thinks he's being stupid and gives him the money. He then hands Matt back his Walkman and says Matt should record the test. In the car, Matt is asking the instructor about his bribery scheme as the tape plays but the instructor spots it, grabs the tape and runs off. Matt chases after him as the instructor closes a gate Matt grabs him and gets the tape from his pocket. 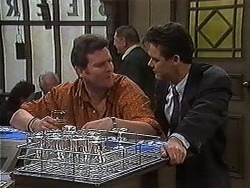 Madge is showing Eddie round as Paul enters, Des is at the bar and tells him that his boss is sending him back to Perth to sort some problems out. Des says he is off first thing in the morning and it could be for a while, he's waiting for a date that hasn't shown up yet. Madge, Beverly and Harold are preparing dinner, Madge is very nervous as Felicity arrives, she immediately insults Beverly by saying that Dr's get paid too much. She then goes to smoke but Harold tells her she can't inside the house, Felicity then says she will leave so Madge makes Harold find an ashtray! FELICITY: I'm sure I've seen your (Madge's) dress before, I know, I was offered that line for my boutique. I prefer something more stylish but it's very you! 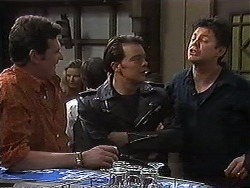 Des's date hasn't turned up; Joe and Matt come in and tell them about the driving instructor. The centre let Matt re-take the test and he passed, Joe is taking all the glory and is also not happy with Eddie's pint pulling skills. Chrissie tells Caroline not to tell Paul the truth about the computer just as Paul comes down after having a bath. Caroline tells Paul the truth who is taken aback, Caroline says she was frightened to tell him, Paul is angry about the wasted time and money. He then shouts at Caroline and says she must fix it or she is sacked! Madge wants Felicity to look over some suggestions that the Waterhole customers have made, Felicity isn't keen but agrees to have a look. Paul tells everyone about the computer; Joe is confused as how a computer gets a virus! Des is unhappy about being stood up again and Paul offers a Bloody Mary. Eddie then puts on a Tom Cruise style Cocktail show to a very impressed audience. Felicity has had many cigarettes as Harold coughs! One of Harold's suggestions is allowing young people to sit in on Council meetings; Felicity is not impressed about allowing hooligans into the Council chambers. 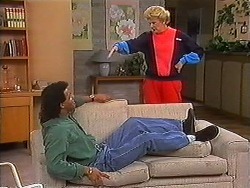 FELICITY (to Beverly): Talking of hooligans, how is that nephew of yours behaving himself? Felicity then says she will support Madge's ideas if Madge does the same for her. Madge says she will judge each idea individually, Felicity then decides it's time to leave. Harold, Madge and Beverly are glad to be rid of Felicity, Beverly leaves and Harold and Madge head to bed. Caroline and Chrissie arrive so they can go to see Eddie's new home. Eddie says he's too busy and it will have to wait until tomorrow. 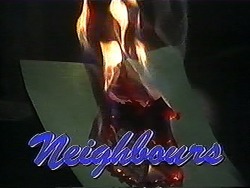 One of Felicity's cigarettes was trapped in some paper; it's beginning to catch fire on the sofa that Madge borrowed from Helen. As Harold and Madge sit in bed, she is worried that Felicity doesn't like her as they go off to sleep. Meanwhile, in the living room the papers are now on fire!